WRAPUP: It was a great day of racing!! We had several people from the Milwaukee club come down to join us, a handful of new faces, and lots of regulars. The racing was close, but not too aggressive, and the “backwards” full track layout was fun. Thanks to all who participated to make this a really fun Team event, and thanks to Dustin from AutoXCooper for supplying CG Lock seat belt locks to the fastest CMMC team!! Dustin from AutoXCooper (and CMMC Board Member) has offered a prize of CG Lock seat belt locks to the winning team!! Once again, it is time for our annual Indoor Kart Racing event at Chicago Indoor Racing!! We will be racing on the large 1400 foot combined track, and running 16 teams of 3, chosen randomly in a one hour team endurance race. Details: Space is limited to the first 48 participants to register. You must be 18 or over and have a valid drivers license. There is room for spectators to watch and enjoy the action. $45 for CMMC members + up to 1 guest. $55 for Milwaukee Club members + up to 1 guest. To register, download This form (PDF format) and send a check to our PO box listed on the form. You can add a comment to this post to hold your spot for a week until the check arrives. Come on out for a short drive around the Lincolnwood Towers area to view the holiday lights. WHAT: Just a short cruise around a cool area to check out the festive houses and lights, and a stop at Jacks Resturaunt for coffee, desert or whatever. WRAPUP: Great company, great food and great raffles!! The street was full of MINIs which drew a fair amount of attention.. It was a really fun afternoon of socializing and talking with MINI club members. 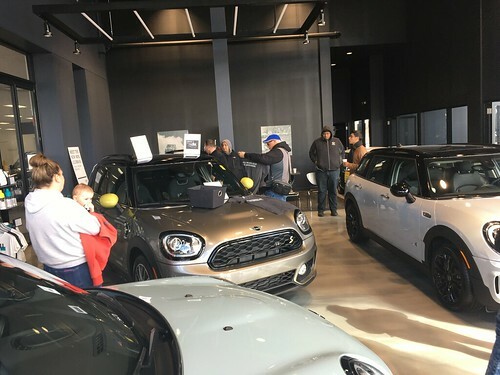 Huge thanks to the following for donating such fantastic raffle items: Bill Jacobs MINI, Dustin from AutoXCooper.com , Blake from CooperGear.com, Lori and Francis!! Jim from www.diecasm.com was unable to attend at the last minute, but stay tuned for some cool stuff in the future. Thanks also to Taylor and family for being such gracious hosts and putting on a great party!! UPDATE 11/15/2007: We have revised the start time to 10:30am because we don’t have a large enough group at this point to get in early. Get ready for some Radio Control racing action!! Update: 06/24/2008 Sorry, this discount offer to our club has been withdrawn.